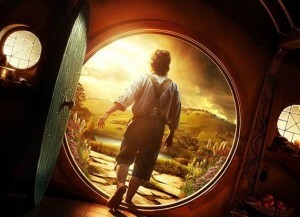 MarkMonitor registers key Hobbit domains. But why? While the third Hobbit film was being finalised between Peter Jackson and Warner Bros, in the background a company called MarkMonitor quietly registered a handful of web domains based on the words The Riddles in the Dark and Desolation of Smaug. It seems likely this is coincidence — Middle-earth Enterprises could easily be registering them for other intellectual property protection or merchandising purposes. However, we know that two brand-new movie titles are required: could these be them? MarkMonitor specialises in brand protection and is the registrar responsible for managing the domains for TheHobbitAnUnexpectedJourney.com and TheHobbitThereandBackagain.com for Saul Zaentz’s Middle-earth Enterprises. From publicly available Whois records, the new domains were all created on July 27 2012, just days prior to Peter Jackson’s announcement of Warner Bros’ green-light for a third Hobbit film. There’s also desolationofsmaug.com, riddlesindark.com, thedesolationofsmaug.com and theriddlesinthedark.com. Thinking of the immediate, it’s virtually inconceivable that a rejigged Hobbit trilogy would use Riddles in the Dark as the centerpiece for the second film. That sequence must be in the first film, surely — possibly one of the culminating scenes. Yet further thought of how the Hobbit unfolds suggests another possibility. Later in the Journey, deep in Erebor halls, Bilbo engages in his own riddling battle with Smaug the dragon. In the dark (obviously). It’s a key event that sets up a great deal of the ensuing action. Could this be the riddles to which this potential (but unconfirmed) name for a second film could refer? Desolation of Smaug is less easy to justify as a title. It does focus attention on the events there that lead up to the Battle of the Five Armies in which Bilbo is keenly involved, though. If all this was the case, the titles would maintain the focus of the story on Bilbo Baggins — an unlikely individual who has the adventure of a lifetime thrust upon him as he helps Thorin and Co reclaim their heritage from Smaug. 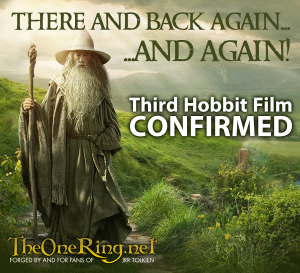 TORn has also learned that this newly announced film will not serve as a bridge film but continue to tell the story of The Hobbit in three parts. Martin Freeman’s Bilbo must remain the central figure throughout with additional material woven into the tapestry. As titles, An Unexpected Journey and There, And Back Again helped convey the arc of Bilbo’s adventure. Whatever they are, the new titles will have to do the same.